We are approaching a convergence in technologies that will reshape transportation and the way cities are designed. In about 10 years everything will change and it will be a disaster for the GCC. Technological change happens very fast. It took only a few years for smartphone penetration to accelerate and go from a luxury to an essential part of daily life. This happened because certain technologies all converged into a single product that made peoples lives better. This is what economists call the S-curve. Once a technology reaches a certain point adoption explodes and everyone wants it. This acceleration is happening at a faster rate because of globalization. Shrinking electronics, cheaper and better cameras, GPS, sensors, WiFi and touchscreens all came together to create the smartphone, a product that traditional phones cannot compete with. The benefits were just too great. The choice for consumers was simple: once prices were within range, everyone bought a smartphone. We are approaching a similar pattern when it comes to electric and autonomous vehicles. All the technologies that need to work together are fast becoming cost effective and can finally compete with the traditional internal combustion engine car. 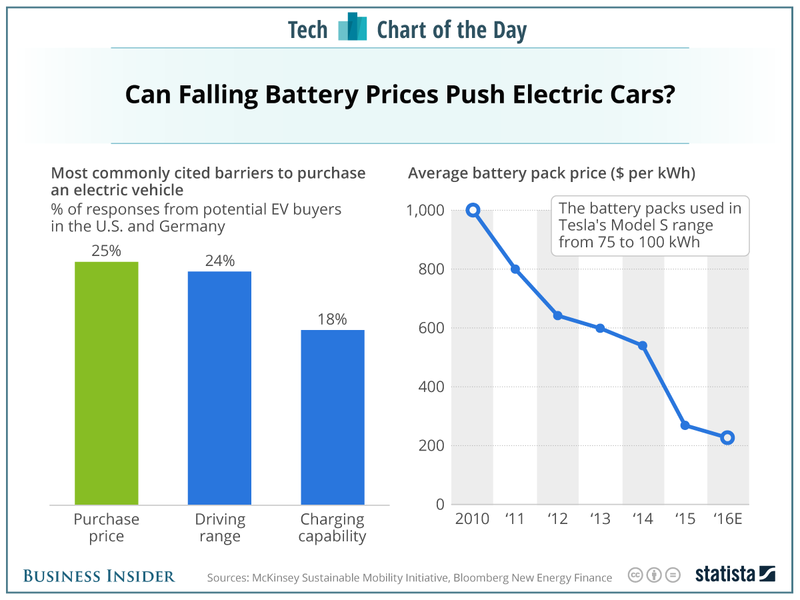 The forecast for battery prices is coming in even lower than expected below $100 in 2020. This will keep getting lower every year. Batteries are by far the most expensive component in an electric car. By 2020 electric cars will achieve cost-parity, meaning they will cost the same as other cars on the market. This is not just Tesla, as every major car maker is developing electric cars to compete. Electric cars will be cheaper. Electric cars also benefit from being much, much easier to maintain than traditional cars, having no more than about a dozen moving parts compared to thousands. 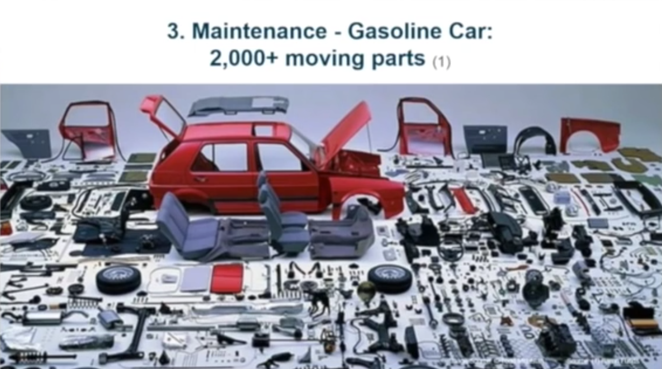 Less moving parts mean less maintenance. Electric cars will be easier to maintain. Electric motors are silent and can accelerate almost instantly. This makes driving an electric car so much fun. A good electric car can accelerate faster than most supercars like a McLaren or Maserati. In fact, Consumer Reports gave the Tesla Model S a perfect score of 100 and calling it “the best-performing car that Consumer Reports has ever tested”. Electric cars are more fun to drive. With technology such as LiDAR and better mapping, most of those electric cars will be autonomous meaning that the cars will self-drive using sensors and cameras. This in turn leads to people deciding not to buy a car at all and relying on the sharing economy or on a fleet of autonomous cars to take them anywhere they want or schedule daily trips to work or school. This is already happening in many cities globally. The cost of owning a car is becoming too high. Why pay for fuel, insurance, parking, when you can just order a car on Uber or Lyft? Cars are parked 95% of the time which is is a waste of resources. The phenomenon of cars-as-a-service will revolutionize transportation and urban design freeing up parking spaces and reducing the number of cars on the road. Electric cars will be optional. Countries like India and China are already planning on investing heavily in electrifying their transportation system and building autonomous fleets. First time buyers in those countries will most likely buy electric. This is beneficial both economically and for the climate because electric cars produce no pollution. Electric cars will be better for the environment. Generating electricity will be much easier since solar technology is finally approaching grid-parity, which means that it will become just as cheap to produce solar power as it is from traditional power generation. It’s currently cheaper in some parts of the world to invest in solar than in building a natural gas or coal power plant. It will keep getting cheaper with every passing year. The problem with solar is that you need lots of batteries to store excess power to use it at night. What if there was a city-wide fleet of electric cars able to store power during the day and selling it back to the grid at night? Electric cars will be the battery for the city. These changes are happening right now. These are not hopes and dreams for the future. This is now. Sounds awesome. So why should we worry? What this all means is that very soon most cars will no longer need petrol and people will need fewer cars in general. By 2030 most new cars will be electric. The GCC is still entirely dependent on oil. For example. the Kuwaiti government needs to spend about 60 billion USD annually to keep the country running. Most of that money comes from selling oil. If people don’t need as much oil anymore, what happens? We are not prepared and in fact we seem to be refusing to accept this reality, going so far as OPEC saying that electric vehicles will make up just 1 percent of cars in 2040. That is crazy. We all think that we have decades to figure out our problems. We don’t. Change happens suddenly. We are not prepared. Perhaps you’d like to know about our bus advocacy project, http://www.buskw.com. We are contemplating developing a programme of works for the project and the critical path from that will give us an end date. There are, however, competing priorities and interests amongst team members, which guides their contribution somewhat as they’re volunteers. Top priority according to our community survey is the schedule. Its really hard to get though as there are no timetables and different information depending who you ask. We don’t want to mislead people. We also want to fully inform them. It’s a tough one, but I hope we can resolve it so people can see how great the bus service is here and end the prejudice against it.